The starting point for paintings, canvas prints and the occasional piece of heavyweight fabric. We build a simple wooden frame, which is called a stretcher, to the size of your image. The thickness or depth of the stretcher depends on the size of the image, the amount of extra canvas around the image, and whether the image has a border (commonly known as a gallery wrap.) We wrap the canvas around the stretcher with just enough tension to keep the image smooth and even, and fasten it with staples along the back. If the canvas has a gallery wrap, it may be hung without a frame for a more streamlined, minimalist effect. Otherwise, you should choose a frame for a more finished presentation. 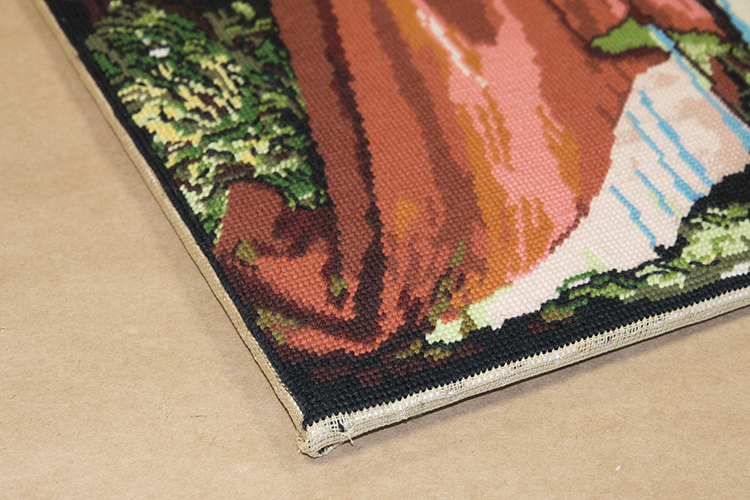 Similar to a canvas stretch, a fabric stretch entails wrapping the fabric around a rigid backing, though it is usually a thin fiberboard rather than stretcher bars. Drymounting is a permanent process best suited for posters, display boards and bulk-printed items. We use a heat-activated adhesive film to bond your artwork to foamboard or aluminum in a large, high-temperature vacuum press. 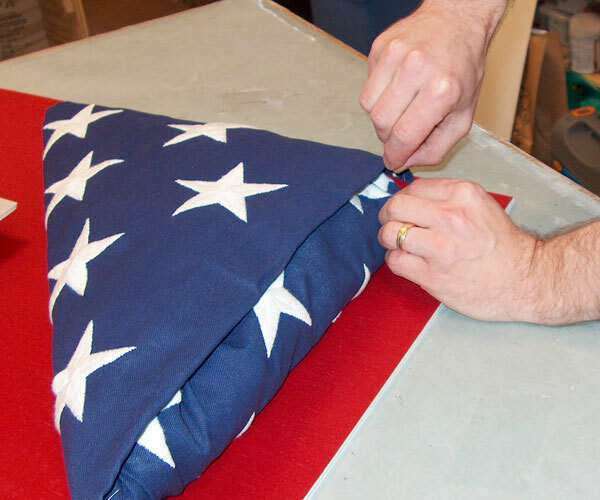 For objects such as sports jerseys or small pieces of fabric, the best way to mount them securely is with a few strategically-placed "invisible" stitches. Using a fine needle to keep the weave of the fabric undisturbed, and using either an invisible or color coordinated thread, we put a stitch or two at a few select points along the edges of the fabric to hold it in the arrangement you selected. For tapestries and other large wall-hanging fabrics, you may choose to skip the frame altogether. We can sew small loops of fabric along your tapestry's top edge, creating a pocket through which you can feed a decorative curtain rod or wooden dowel. We handle a lot of three-dimensional artwork and collectible items at Frame It, and we have several methods to ensure that your precious object stays secure and undamaged in its display. 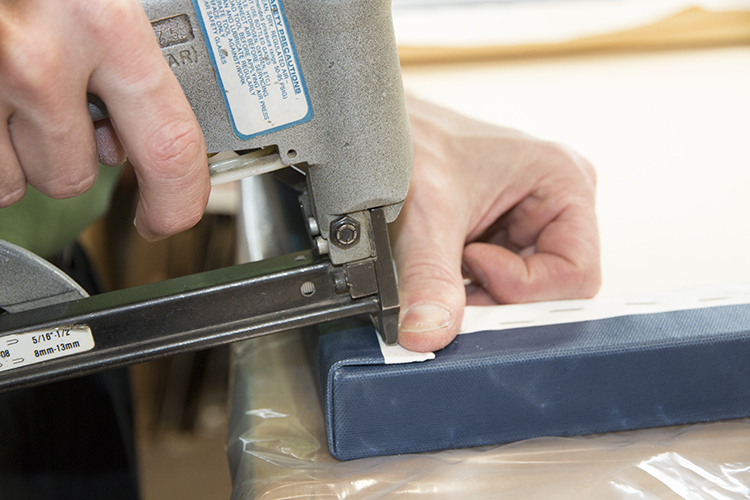 We are adept with silicon, epoxy and a variety of other adhesives for pieces which can be glued in place. If that's not an option, we can fabricate a bracket to hold your artifacts in place without damaging them. If you have questions about a custom mounting solution, please feel free to contact us!